This RJ45 breakout board brings all 8 pins plus shield of an 8P8C / RJ45 shielded modular jack out to screw terminal blocks, providing simple and convenient connection to each connector pin. Each pin is also brought to solder pads (3 per line) at 0.1" spacing, allowing the easy addition of standard pin headers. Please note that the breakout boards are manufactured with a connection between each connector pin and the corresponding terminal block position; no soldering of any type is necessary. The solder pads simply provide an area for making optional connections to additional headers or other components. In addition, this board functions as a buss board, featuring four 8P8C shielded jacks wired in parallel and connected to the solder pads and the screw terminals. 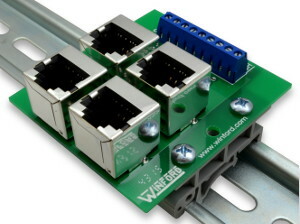 This allows the user to easily break out a connection to screw terminals while at the same time connecting other cables to the same signals via the extra jacks. This is very convenient when "daisy-chaining" several devices together or when wiring multiple devices in parallel. Note that all connections are wired 1-to-1 (ie Pin 1 to Pin 1, Pin 2 to Pin 2, etc.). Approximate dimensions: 2.5" x 2.3"